This entry was posted in Israel and tagged Jews, politics. Bookmark the permalink. 10 Responses to So Was Anthony Bourdain’s Death A Message? certainly seems that hanging oneself requires much more than a passive thing like a scarf and a doorknob. 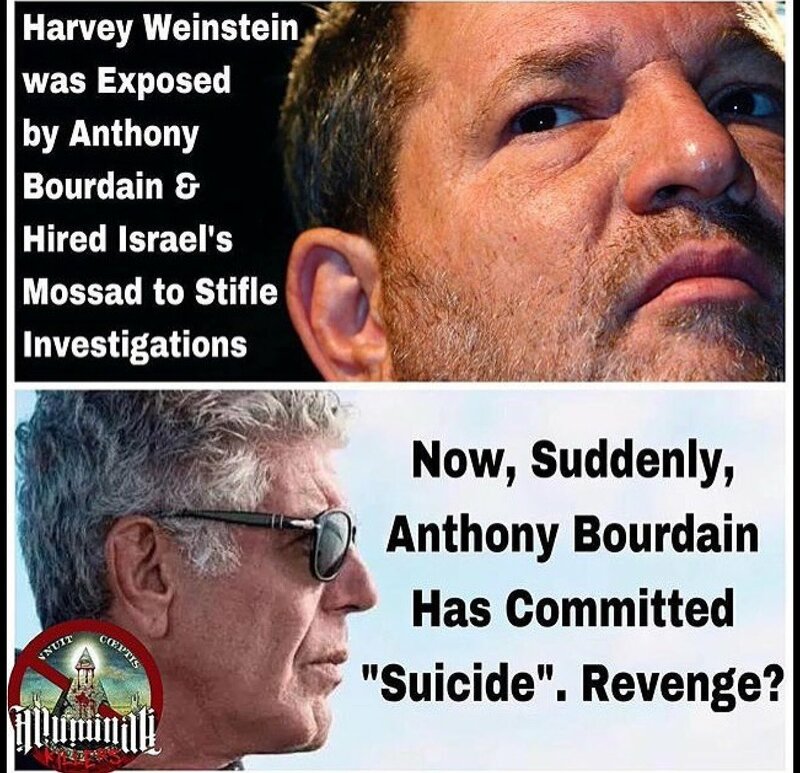 i’ve been thinking many of these suicides are fishy as well. this to me. Bourdain was pro-Palestinian as we all should be. Curious case of Matt Lauer. He is Jewish and worked for a Jewish company, NBC. He was known to be molesting Gentile women but neither the police nor his bosses did anything to protect the women. But NBC did install a switch that Lauer could use to electronically lock the door so the Gentile women could not escape. That is what NBC thinks of you. They despise you. i’ve seen presentations showing more than fifty percent of ‘our’ free press, like in tv and print, are khazar owned and operated. eighty and ninety percent in some cases. curious how eastern european jews have found english sounding names to camouflage who they are so therefore who they represent isn’t obvious. twenty years ago i wouldn’t have even considered such a heinous thought, and then i began to investigate what’s really going on. Alexandre Cazes, creator of the dark market site Alphabay “killed himself” by hanging from a door knob im jail too. His mother does not beleive it is possible. Tell Aviv helicopter crashes with 7 IDF fellow mortals in Romania in 2010. Was a CNN story. Ernst Muldashev (Russian medical doctor, an eye specialist, born in 1948) in Tibet in the footsteps of AH´s Third Reich occultists of the Thule Society who searched for the underground city-countries Shamballa and Agartha. Vid 4.23: The biggest mystery was about the small Kailash mountain a (mountain?) pyramid with the height of a 4-floor building located next to the holy Moutain Kailash. He found the legendary Shantamani stone with the inscribed info how they build the giant Kailash pyramid and the underground city-countries Shamballa and Agartha beneath. According to the Tibetan txt it contains the matrix of Life on Earth. Muldashev researched these objects thoroughly. He made maps, showed them to his colleagues with the DNA pyramid matrix of Life on Earth. What does that have to do with the crashing of a Tel Aviv helicopter with 7 IDF military men in Romania?